When choosing a new home builder, it can be a tough decision knowing the integrity and quality of the home you are having built. Here at Avex Homes, we take pride in the quality and craftsmanship of our homes as well as the vendors we choose to work with so that we are assured of the product that is being used. Timberlake Cabinets is a division of American Woodwork Corporation that has been around since the 1980s. As the third largest manufacturer of cabinets in the United States and Canada, American Woodwork Corporation focuses primarily on “on-time and complete” cabinetry. Made from 75 percent verified sustainable American hardwoods, sustainability, and localness matters. As a new home builder, we try and reduce our carbon footprint as best we can and Timberlake Cabinets makes a point to do the same. As members of NAHB National Green Building Program, KCMA Environmental Stewardship Program, CARB Air Toxic Control Measure, and LEED for Homes, Timberlake products meet specific guidelines and certifications that really hold the sustainability we desire for our homeowners. 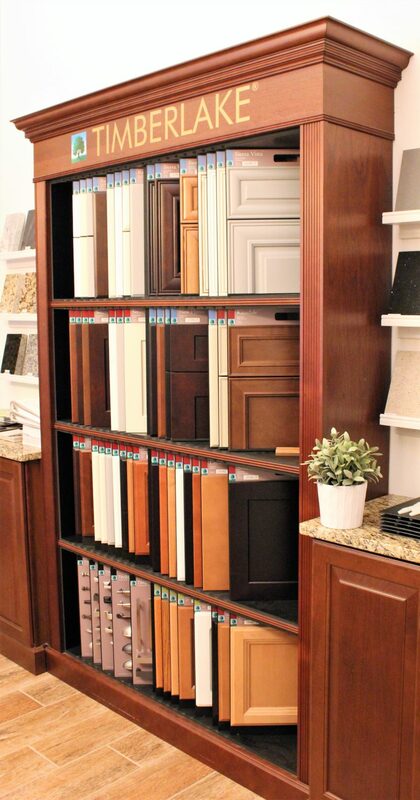 There are three product lines within Timberlake Cabinets and a total of 18 collections to choose from. Portfolio Select: We offer 4 of the collections within the Portfolio Select product line. These cabinets are made of solid hardwood doors, 21’’ deep dovetail drawers, full access hidden glides, ¾’’ thick wall and base shelving, and a 5-year warranty. The Portfolio Select range provides a custom-built look in your home with quality and style. Portfolio: We offer 6 of the collections within the Portfolio product line. This product line of cabinets are made up of veneer and wrapped doors, 21’’ deep drawers, side-mounted glides, ¾’’ thick wall and base shelving, and a 5-year warranty. The Portfolio range is a homeowner favorite. Value Built: There are 2 collections within the Value Built product line. This product line was created for the budget conscious homeowner that still wants the quality and craftsmanship of a Timberlake Cabinet. This range provides veneer doors, 18’’ deep drawers, side-mounted glides, ½’’ thick wall and base shelving, and a 2-year warranty. Remember your new home is only as good as the products that are used to build it so always make sure your new home builder is using reputable products, like Timberlake Cabinets.